The 2013 science fiction thriller directed by Alfonso Cuarón, starring Sandra Bullock and George Clooney, proved to be a box office hit. With the film’s score alone, earning a nomination at the 2014 Golden Globe Awards, and winning Best Original Score at the Academy Awards and British Academy Film Awards. British composer Steven Price has worked through many roles in music since graduating with a First Class music degree from Cambridge. He had been a successful programmer, arranger and musician before Howard Shore employed him as a music editor on the scores for The Lord Of The Rings trilogy which were followed by Batman Begins in the same role. Striking out into the field of film composing he found success with the sci-fi comedy Attack The Block followed by The World’s End this year. 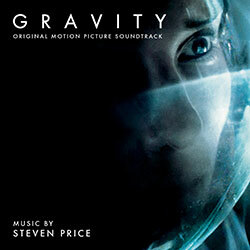 The score for Gravity is integral to the film as Price explains, “From my earliest meetings with Alfonso (Cuarón, director) it was clear the score in Gravity would play a crucial and expanded role. With no sound in space, the music was integral to underscore the emotional journey”. The BAFTA and Oscar winning soundtrack is now available on CD via Silva Screen Records, checkout the tracklist below.